This Healthier Leek and Potato Soup uses fat-free Greek yogurt instead of heavy cream and doesn’t skimp on the flavor! Shallots, saffron and cayenne are all used to spice up this creamy soup. 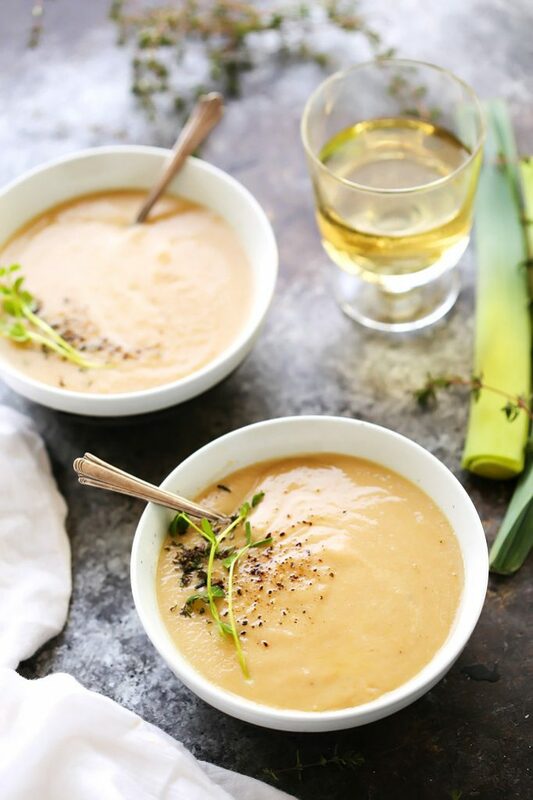 When Rick and I first started dating and I learned that Potato Leek Soup was not only one of his favorite soups, but also one of his favorite foods, I set myself out on a mission to create the most delicious bowl of it that I could. I wanted a bit more. My version ups the flavorings a bit – Instead of just potato and leek, I threw some shallots in there too – They sweeten things up a bit and give an extra layer of flavor right from the get go. After that, I didn’t want to get too complicated – This is Potato Leek Soup after all – I really wanted those flavors to shine through. But, for good measure, I threw in a pinch of saffron and a dash of cayenne – Just for that little hint of something extra. Oh, and instead of using heavy cream or crème fraiche, I lightened this soup up by using greek yogurt as a stand in – Not only is it fat-free, but it also gives a nice tang to the soup while still adding that great rich, creamy texture. To easily clean your leeks, thinly slice them and place in a large bowl filled with cold water. Let the leeks soak for a few minutes to allow the grit to sink to the bottom of the bowl. The leeks will float to the top. When ready to use, scoop them out with a slotted spoon or your hands, allowing the grit to remain at the bottom of the bowl. I generally use white vermouth in place of white wine for my cooking. It keeps indefinitely on your counter and lets you keep that good wine for drinking! If you can get your hands on some white pepper, try that in place of black. It’s got a bit more of a delicate flavor and won’t color your soup. Unlike Rick, Potato Leek Soup might not be my favorite food of all time, but it’s definitely become one of my favorite soups to enjoy when it’s chilly and rainy outside. Do you have a favorite soup recipe that you love? I’d love to hear in the comments below! 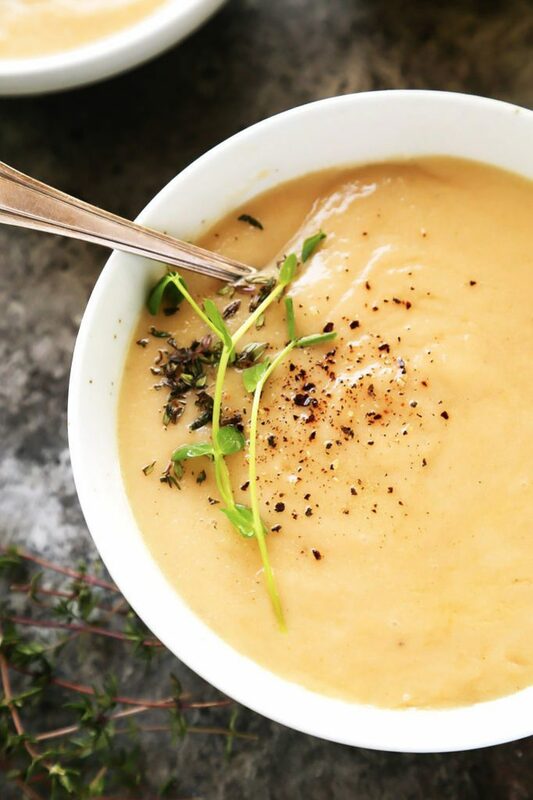 This Healthier Creamy Potato Leek Soup uses fat-free Greek yogurt instead of heavy cream and doesn't skimp on the flavor! Shallots, saffron and cayenne are all used to spice up this creamy soup. Heat olive oil and butter in dutch oven or large stockpot over medium-high heat. Once foaming has subsided, add leeks, shallot and celery. Saute 5-8 minutes until vegetables have softened. Increase heat to high and add white wine. Cook until evaporated. Add the chicken stock, potatoes, bay leaf and thyme (and other spices if using) to the pot and bring to boil. Boil until the potatoes are soft, 15 to 20 minutes. Using an immersion blender (or in batches in a blender or food processor), blend the soup until smooth. Season to taste with additional salt and pepper. Serve immediately or return to pot and keep warm until ready to serve. If you loved this Leek and Potato Soup recipe I would appreciate it so much if you would give it a star review! Also, be sure to snap a picture of your finished bowl and share it with me on Instagram using the hashtag #platingsandpairings. This soup would pair wonderfully with a Sauvignon Blanc, Pinot Gris or Chardonnay. 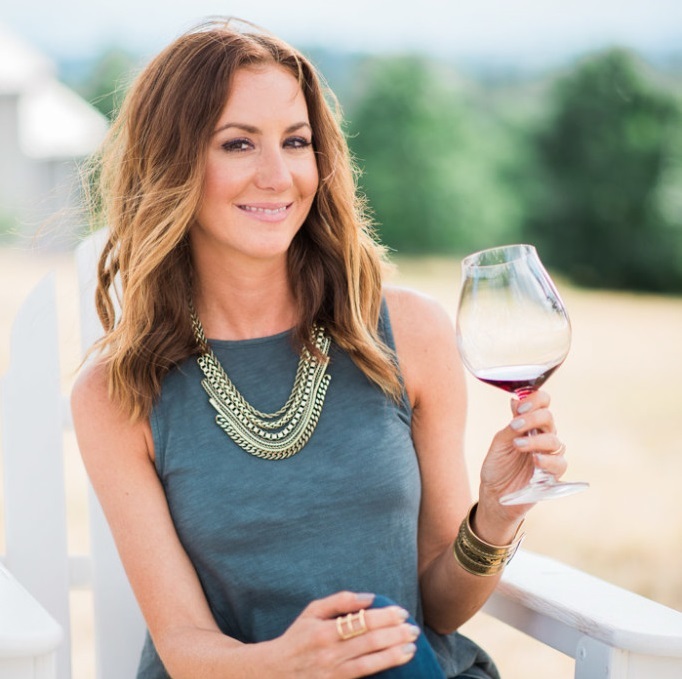 If you’re looking for a red option, go with a light-bodied variety like Pinot Noir or Beaujolais Nouveau. Yummm!! My mom makes leek and potato soup and I’ve tried a couple times but I’ve never blended it before and sometimes the leeks get kinda watery. Blending is a good idea! These photos are beautiful. I love all of the flavors you’ve used in this soup! I can’t wait to try it. Yes! I have just enough leeks leftover from my quiche making yesterday to make this soup today. It looks delicious. Thanks Aimee – I hope you get the chance to try it out! Hi – There is nothing in the soup, just the soup itself. I hope this helps and I hope you enjoy the recipe! Just made this for my daughter who has a cold and a sore throat. It was absolutely delicious and the cayenne is lovely when you’re feeling a bit under the weather. Thank you for sharing. I’m so happy to hear that you liked! I hope she feels better soon!